These days, it can often feel like all vehicles look the same. Especially when it comes to compact cars. This is why models like the Beetle have managed to stand the test of time. This heritage option in the VW lineup has always been a vehicle that is highly recognizable as it follows its own design cues, rather than the passing trends of each decade. Likewise, the Mini Cooper remains a quirky choice that many look to when wishing to stand out from the crowd. So how does the 2018 Volkswagen Beetle compare vs the 2018 Mini Cooper? 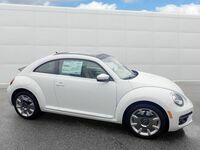 Despite coming in with a starting MSRP that’s more than $1,500 less expensive to start, the Beetle also manages to offer more power and better starting features. 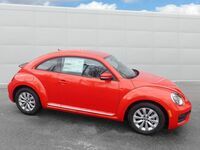 What you’ll love most about the 2018 Volkswagen Beetle is that it’s not relying heavily on its appearance to draw in shoppers. With a 2.0-liter turbocharged 4-cylinder engine that offers 174 horsepower and 184 pound-feet of torque, this compact car has a lot more oomph than you might have predicted. Following the trend toward automatic transmissions, this model also offers the six-speed automatic with Tiptronic and Sport driving modes as standard equipment. While the Mini Cooper also offers this as an option, the standard transmission is a six-speed manual. For a vehicle that is already more expensive, this means an even more costly upgrade. The Mini Cooper does offer more engine options to get a peppier driving experience, but these, too, will raise the model thousands of dollars above the base price and the cost of the Volkswagen Beetle. 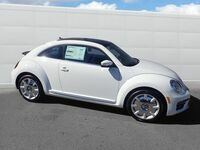 When it comes to dimensions, the Beetle has the slight edge with 55.3 inches of front shoulder room, 41.3 inches of front legroom and 39.4 inches of front headroom. This is compared to the Mini Cooper’s 50.6, 41.4 and 40.3 inches, respectively. 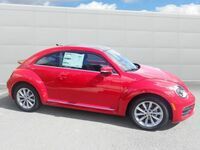 The 2018 Volkswagen Beetle offers standard features that include independent MacPherson struts, cruise control, remote entry, Bluetooth with audio streaming, a five-inch touchscreen, review camera and more. Find out if it’s the right choice for you when you stop by Dirito Brothers Volkswagen for a test drive.